“There is a widespread failure in the way that (.MOV) files are handled by the Quicktime Library. I have attempted to compound my findings on this issue. Nearly every (.MOV) enabled application that I tested fell victim to this exploit. 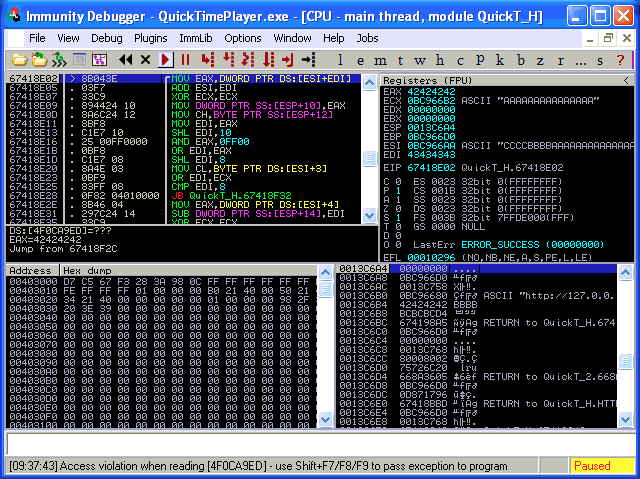 This is a local memory corruption vulnerability in the way these programs process a malformed file. I have provided crash logs, register dumps where applicable, sample script and trigger file. Memory Corruption is repeatable and code execution seems possible. Because this issue affects web browsers it seems that the attack vector will be both Local and Remote. You can now take OffSec's most popular in-person training as an online course. Jump Start your InfoSec Career Today! PWK For those who need to acquaint themselves with the world of offensive information security. CTP In-depth examination of the vectors used by today’s attackers to breach infrastructure security. AWE Offensive Security’s most demanding and challenging Windows exploitation course. AWAE Take a deep dive deep into the realm of advanced web application penetration testing. Wi-Fu Learn to conduct effective attacks against wireless networks of varying configurations.